Today, the question goes unanswered for longer, due to the fact that today is a 'two-camera day'. As well as the trusty K5, we are giving our old superzoom (a Fuji S100FS) its first outing in aeons. I have it round my neck and am trying my utmost to re-acclimatise myself with the menu system or at least look the part. But before we go in search of all creatures great and small, that question has just been asked again - and this time demands a response. These were taken at Breakwater Beach. 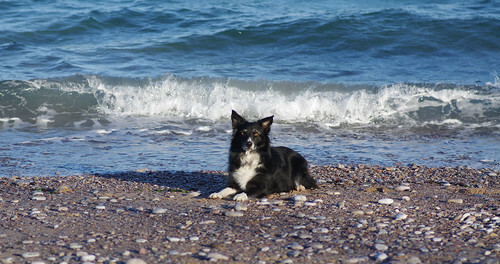 It was a clear day, the breeze was biting and the sea looked particularly blue. 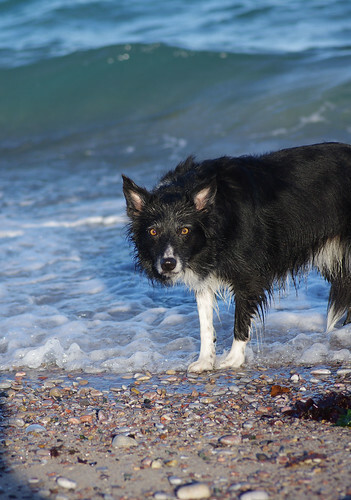 Sherry assures me that the sea was warm to touch. But I was already preoccupied elsewhere, immersed in a miniature world. It's always encouraging to record something that matches its species description. 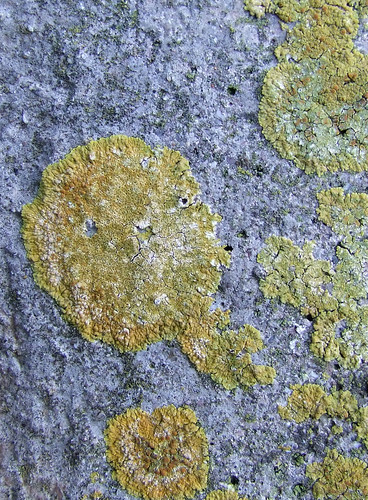 These lichens were on limestone rock near to the steps at the far end of the beach. 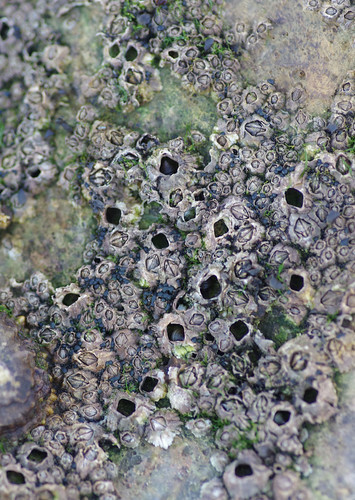 Viewed from above these barnacles resemble a range of volcanoes. It was only when I looked closer that I discovered another form of life. 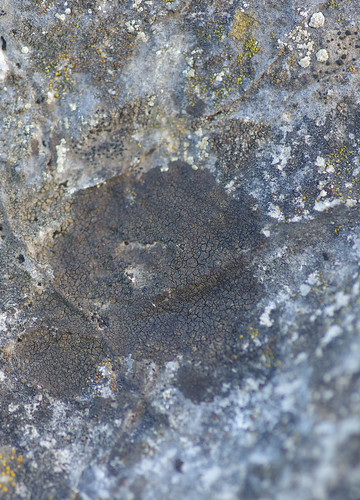 Just below the centre of the picture (and scattered in other places) are some minute, rounded organisms. They are Rivularia atra, a species of marine algae, scientifically referred to as cyanobacteria. 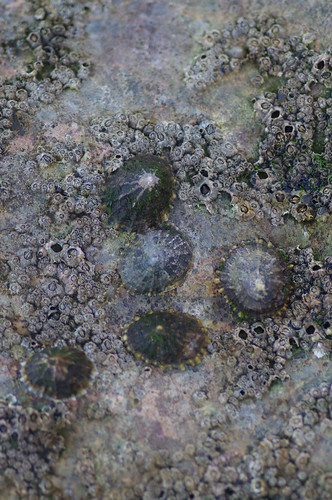 These are probably Common Limpets (Patella vulgata) although they could also be Black-footed Limpets. I didn't bother to prize these molluscs away from the rock and examine their bits because they looked quite comfortable where they were and it looked like hard work. 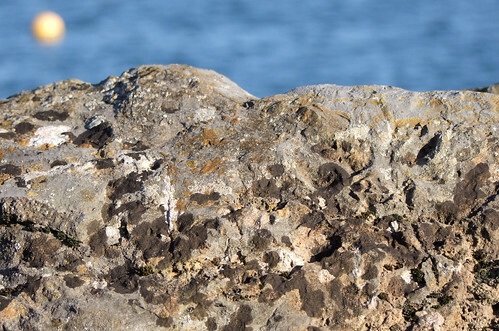 Limpets can dig themselves into the rock and make a body print that varies slightly between the species. 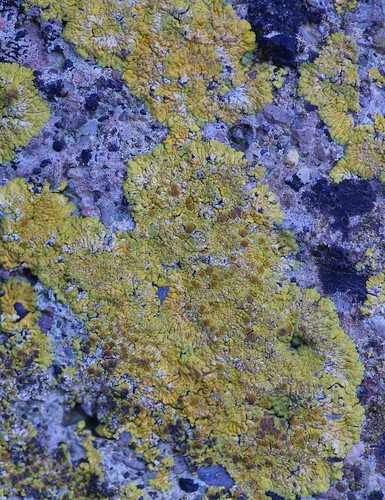 Another Caloplaca aurantia specimen. There are more of the apothecia (the orange-brown discs) on this one and I really like the contrast with the varied texture of the rock. I haven't managed to identify this pair yet. 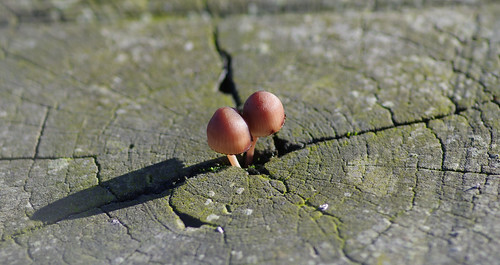 They were growing out of a circular wooden post near the booths for boat trips. By lucky coincidence the shadow just happened to be right opposite the main crack in the post. This shot was subsequently cropped thin and wide to accentuate the diagonal shadow line. While the superzoom can't compete with the DSLR in the image quality stakes, the extra reach of the lens came in handy. 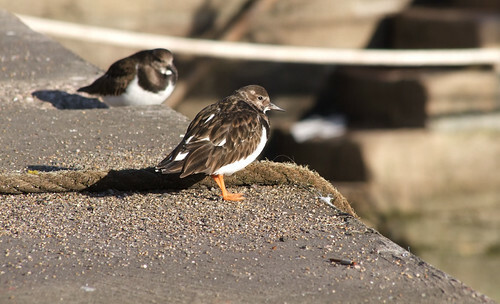 Turnstones are busy little birds, forever risking life and limb by scuttling back and forth across roads. Perhaps they are poor flyers because I have only ever seen them on foot. A couple of shots were even closer but the fag-end in front of the bird's feet ruined the effect. At the end of the harbour we walked along the coast path, where protective boulders have been placed as a barrier. This species is often found around the high water mark (or above it in this case). The jury's still out on this one. And they do not expect to return a verdict for quite some time! 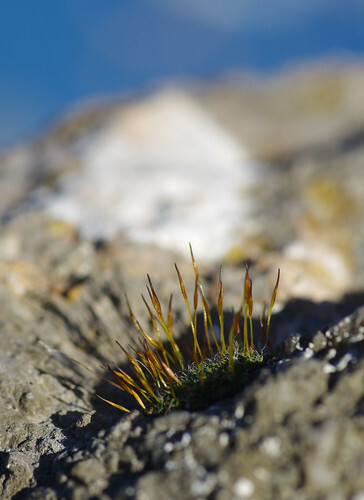 Instead, we turned our attention to mosses, hoping for more conclusive results. This species is striking and almost ubiquitous. According to my guide it is one the first mosses the 'beginner' will find. There's nothing like a sweeping statement from the experts to fill you with confidence. But if only they were all as easy to identify as this one! 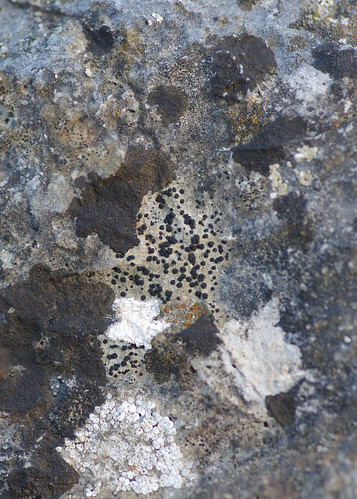 The black, crusted and cracked lichen is Verrucaria nigrescens. The scattered minute orange-brown discs could be Caloplaca oasis. According to my field guide, this is a parasite of various Verrucaria species. 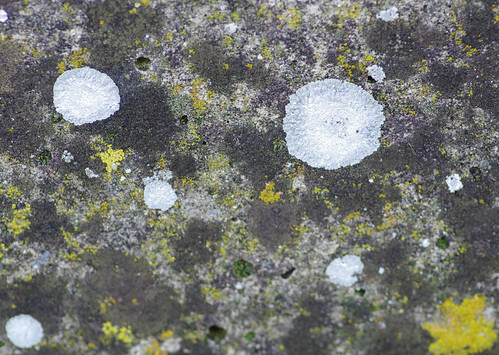 The black dots and the white lichens, I will have to come back to and study in more depth. We could have stayed by this rock for hours and come away none the wiser. Logically, the next step will be to acquire a high magnification hand lens and study one section of the rock surface at a time. I reckon we could easily garner another ten species, given time and a good deal of patience. 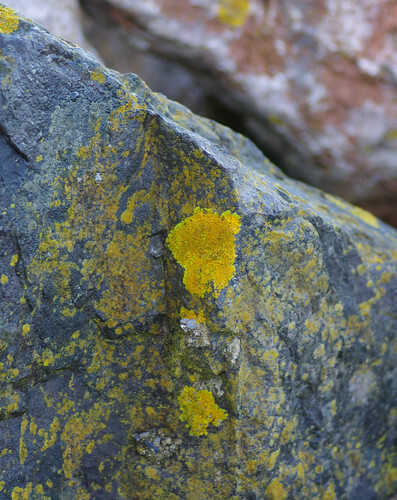 This species is paler than Black Tar Lichen and has more cracks in its surface. At length, we left the rocks (and several potential headaches) behind, and headed homeward. This was just past Battery Gardens on the way back. 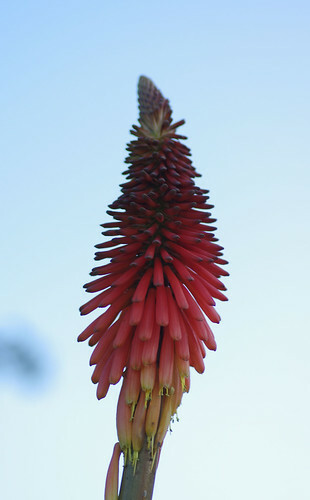 It would be something I might expect to find on the Isles of Scilly, in a subtropical garden. But I was stunned to see it in Brixham in December. It was on a wall outside the allotments. I doubt this properly qualifies as a wild flower. It was probably planted but it was far too alluring not to photograph and provided an exotic end to our walk.